Vulkan Support: Vulkan is a graphics-rendering API that offers enhanced OS compatibility and performance. Some of the benefits include reduced CPU load time and the ability to work on other tasks, plus CPU scaling that takes advantage of multiple cores. Vulkan also runs on different OSes (Windows 7, 8, 10), and still receives all of the advantages as if it were running on the latest OS. UI Improvements: A full menu reworking makes the game more accessible with new orbital ability icons, improved chat displays, and more. Campaign and Scenarios: Several scenarios and all 3 campaigns have been updated to refine difficulty levels, adjust to the changes of previous updates, and improve the user experience. Modding: Modders have access to more parts of the game and will benefit from several changes that makes modding more intuitive. Balance: Changes to air units, anti-air, drones, and dreadnoughts will improve strategic diversity. The Substrate also received some additional changes in order to differentiate themselves from the PHC. make sure to grab them for up to 50% off before the sale ends on August 28th! Grab a friend (or two or three!) for some epic battles on 9 brand new maps designed specifically for cooperative play. Gamma Draconis: If you like fast-paced and aggressive, this 2v2 desert map is for you. Combine efforts with your teammate for a deadly push through the map’s center, or favor a more devious approach by focusing your enemy's flanks. Trappist: Designed for 3v3, but playable in many other game modes, the center of this medium-sized map contains a massive stockpile of resources. You’ll have to move quickly to prevent it from falling into your enemy's hands. More info on the FREE Co-op Map Pack DLC can be found here. up to 50% off on Steam through August 28th, 2017. Game lobbies no longer default back to private. When a match is exited, it will revert to whatever match type it was before that. Players can now select no team in a game lobby. Previously every player would have to manually select a separate team to play a Free for All match. Buildings no longer suffer from Attrition damage when in enemy territory. Updated several Dreadnought upgrade tooltips to specify the exact value they provide. 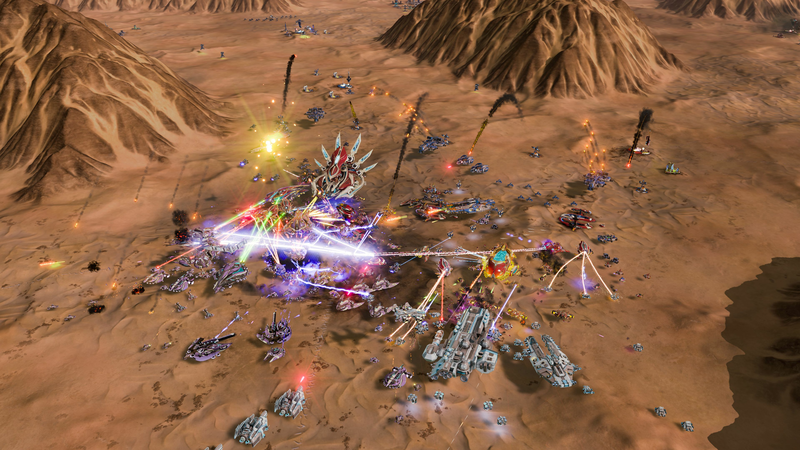 Dreadnought and Juggernaut formation changed to be at the front of the units in its army. Previously units in a Dreadnoughts army would be in front, which was rarely desirable as they would get quickly focused down. Players often had to micromanage the positioning of their low tier units to keep them safe behind, especially in the case of PHC Medics. Dreadnoughts & Juggernauts now act as a spearhead when leading armies, which incentivises using Dreadnoughts in synergy with armies and the buffs they can provide. Cronus retains old formation due to being an artillery dreadnought. Most Orbital Upgrades have received a new and improved icon. In-game chat now displays whether a message was sent to Team or All. Shift + Enter now always opens All chat, Enter always opens Team chat, unless not on a team. Lobby chat now displays the player's name in gold, so it is easy to distinguish from the blue text of the chat messages. The percentage character, “%” now display properly when typed in lobby or game chat. Host of a lobby can now set team and spawn for other players who have joined. The countdown text in a lobby now displays "Cancel" in front of the numbers to indicate players can cancel the countdown. 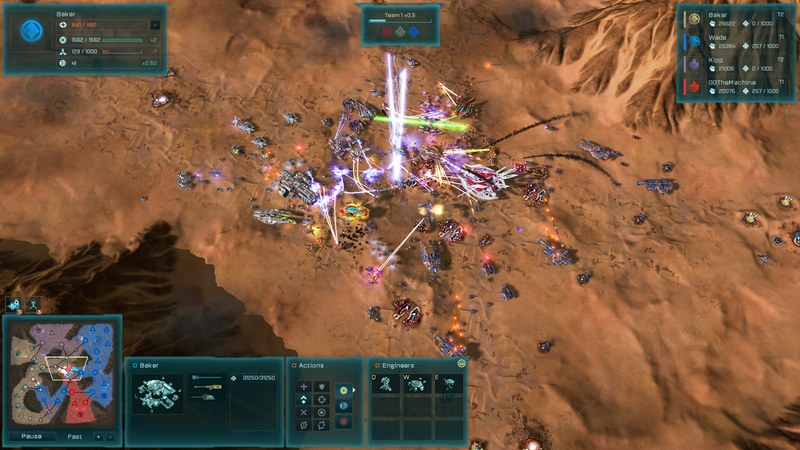 If minimized, the Ashes of the Singularity icon now blinks when an automatch game has been found. All Sub-menus have had left to right ordering reexamined to put the primary button such as “Load Game” before “Back.” People read left to right, so it is more intuitive to put the most commonly used button to the left. This is standard amongst most RTS game menus, we want to make the menus and interface for Ashes as intuitive and familiar as possible for new players coming in from previous RTS games. New Button: Join Discord. Now links to the official Ashes Discord channel. Any player can now be controlled in the modding debug tools, instead of only being able to toggle between player 1 and 2. Mods are now able to assign a Quanta cost to buildings, using the BuildingTemplates.csv file. Mods are now able to modify Physics, using the RigidBodyTemplates.csv file. Mods are now able to modify unit movement, using the FlockerTemplates.csv file. Mods are now able to modify Formations, using the FormationTemplates.csv file. Several variables that were previously references as Integers are now referenced as Strings, to make it more intuitive for modders to change. Separated and tidied up the way Drones are configured to make changing them more intuitive for modders. Configuration files in mod directories now add to the base configuration instead of replace. This means modders won't have to go back and update their mod as we continue to update the base game, depending on what the mod is changing. Multiplayer is no longer disabled when mods are enabled. However, mods themselves will be disabled when multiplayer modes are selected. (There is a prompt to notify players of this) Therefore it is still not possible to play multiplayer with mods with the public build. We are planning on supporting this in the future and this is our first step, but for the time being, the "modding" Steam beta will continue to be required to play multiplayer with mods. Note: In order to make modding more user friendly, some of these changes break compatibility with mods created for previous versions. To update previous mods, a few changes are required. Refer to this thread to find out how. 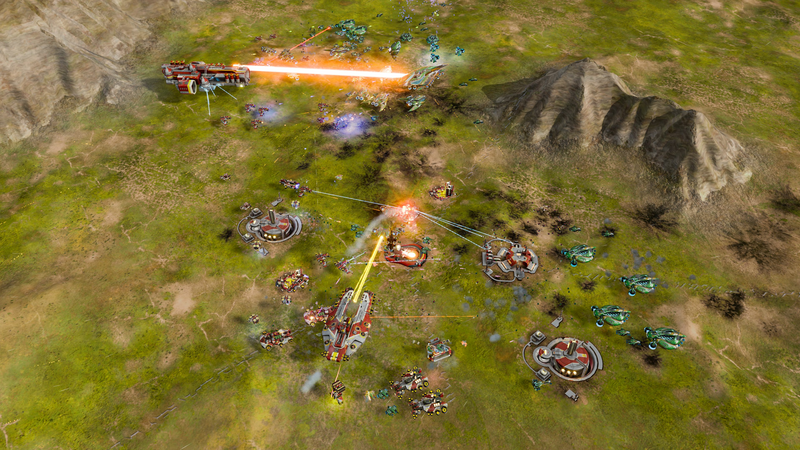 Eltanin suffered from having a scarcity of resources, limiting the amount of units and strategies players could field. It also had an unfair resource distribution, where some players were getting access to more resources than their teammates. We are increasing the total amount of resources for each player and evening it out, so each player has the same amount. We don't want players to feel victimised for having a disadvantaged spawn, or players rush to fight over resources against their own team mates. Lair of the Turtle had a tiny amount of Radioactivies compared to Metal, which limited high tier units. It was also slightly unfair for the top left spawn. We are increasing the amount of Radioactives the player has access to, mostly in their base to stay consistent with the design of the map. Changing the build speed map option no longer affects resource costs. Fixed a bug where the in-game attack range display on the weapon tooltips used data from max tracking distance and not max attack range. As a result, the attack ranges listed on the weapon tooltips will be lower than before. Fixed a bug where revealed Emergency, Sapper and Serpentine Turrets weren’t leaving a targetable icon through Fog of War after being revealed. Fixed a bug where player names were being displayed as [Unknown] when replays were opened by a different user. Fixed a bug where the drop down choices for “Capture Speed” was not properly ordered. Fixed a bug where pathing was obscured on the top left of Regulus. Fixed a bug where the camera panning was behaving differently after a camera manipulation took place in a scripted mission. Fixed a bug where the the voice over at the post game screen was excessively loud. The Assembly will no longer cost Radioactives, so the starting resources is no longer necessary. PHC and Substrate no longer start with 100 Radioactives. Neutral Generators spawning anti-air creeps was frustrating as it made maneuvering around the map with air units too punishing. Players were forced to micro-manage their air units to avoid the AA creeps which is something we don’t want to force on players, especially as it was hard to avoid with the wide flying patterns of air units. Generators no longer spawn anti-air creeps. In 2.3 we gave the Assembly a Radioactives cost to balance it against the Armory. This was a noob trap where new players, and the AI on certain settings, could get stuck running out of Radioactives and unable to progress. We are reverting this Radioactives cost and applying a different approach to balance the Assembly. This is more thematic with the lore and the asymmetric design of PHC and Substrate. The Assembly is getting its durability lowered so it is much weaker compared to the PHC Factory and Armory. Now there will be a direct tradeoff; Substrate get more flexibility on the cheaper Assembly, while the PHC Production is much more durable. Many other Substrate buildings are having their durability lowered below that of the PHC equivalents to further refine the theme of PHC toughness vs Substrate Flexibility. We want to try and make the factions feel more unique and asymmetric, but in a way that is balanced and fair. The Quantum Archive had 200 more health over the PHC Quantum Relay which was especially unfair considering it has shields. We are reducing the durability of the Quantum Archive below that of PHC Quantum Relay to compensate for the fact that Substrate do not have storage limits and will not be investing Quanta in Storage upgrades. The lack of resource storage limitations makes producing Dreadnoughts and Heavy Air units much easier for Substrate, as players can then bank up a large amount of resources. We are lowering the health of these structures to compensate for bonus of not having storage limitations, as well as to compensate for the fact the Substrate structures have regenerating Shields. There is a huge disparity between the health of PHC and Substrate Tech Structures, where Substrate equivalents are far more durable. This was especially unfair given the shield regeneration and other bonuses Substrate have over PHC. We are making the health more consistent between tech buildings, but giving PHC a slight edge in building health. Radar and Building upgrades were rarely invested in as they were a much weaker investment compared to damage and unit health upgrades. We want to encourage more strategic diversity with Quantum Upgrades, and to incentivise the building health upgrade to compensate for the health reduction some of the Substrate buildings are suffering. Air units had more health than ground units, which was quite misleading as they are not durable due to how powerful anti-air weaponry is. As part of our ongoing goal to make Ashes more intuitive and welcoming for new players, we are making the following adjustments. All dedicated anti-air weaponry damage halved. Aside from the primary benefit of making air unit survivability more intuitive, there are a number of other side benefits. Support Orbitals will be more beneficial, such as Nano-mesh Barrier or Intensive Care. The Harvester is the only air unit not getting its health reduced. This is to make it more survivable as they were too easily picked off by enemy interceptors. The survivability of the harvester was less than the health suggested,as being stationary meant enemy interceptors were able to focus it down much quicker to other air units which are fast and evade attacks. Health has not been reduced alongside other air units, effectively making it twice as durable. The gunships were flying far too slowly, which didn’t make them feel like air units. We are increasing their movement speed but increasing cost to compensate. They are also losing the ability to target drones, and the Rampager is receiving a slight damage reduction. Movement speed increased from 300 to 500. The Marauder had a very basic and boring movement pattern, where it would sit above its target without moving. It didn’t feel like a gunship, it felt more like a floating tank. We are increasing its flying height and changing its movement profile to make it more active and maneuver around its target to make it look more engaging. Since it is moving around a lot more, it is firing less regularly than before and has a lower effective DPS. To compensate, it is getting a small health increase to differentiate it from the Rampager which is faster and has more damage, but is less durable. Movement speed increased from 300 to 450. The Air Harbinger was too fast for a heavy gunship with so much health and damage. Movement speed reduced from 500 to 300. Armor reduced from 70% to 60%. The Martyr and Reaper were overperforming compared to PHC Frigates. 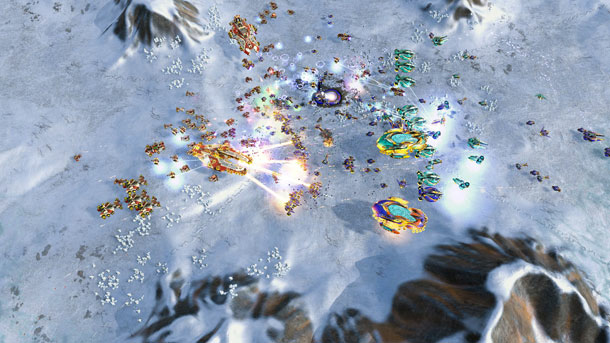 They were balanced cost for cost in a vacuum, which did not hold up to an accurate representation of a real match, due to the Shield regeneration making Substrate have a much stronger ability to capture regions in the early game, and being able to out produce the PHC due to being able to heavily invest in Assemblies which also then transitioned into Cruiser or air production. The Sky Cleanser was underperforming, it also had too much durability for a Frigate. It is receiving damage and armor-piercing in exchange for losing survivability to make it more consistent with the health of other frigates. This exchange is especially beneficial against the Strategic Bomber as they previously were one-shot by it. Since air units are having their health reduced, the Drone Hive will become a much more effective anti-air unit. To compensate, it is having its damage reduced to be less powerful against other units. The Drone hive also had a dispropriate amount of shields to health compared to other Cruisers. We are exchanging some of its health for more shields to make it more benefitted by Caregivers and Regenerators, and more vulnerable to EMP Pulse. In contrast to the Drone Hive, the Mauler had too little shields compared to health. This made it especially vulnerable to the EMP Pulse Orbital. The Mauler is getting less shields in exchange for more health to be consistent with other Substrate Cruisers. However, it is overall losing 100 shields in order to make it slightly weaker than the Athena. Previously the Athena and Mauler were equally balanced, which benefits Substrate given the advantage of having cheaper, more flexible Assemblies with no resource storage, making it much easier to outproduce PHC opponents. Like many other aspects of Substrate, the Mauler will now be slightly weaker than the PHC equivalent. Increasing the range of the artemis will lower the amount of micro required to use the Artemis to outrange base defenses, while removing its area of effect tones down its damage output. Attack range increased from 1250 to 1400. Area of effect removed from anti-building attack. The Mobile Nullifiers were jamming too much for a mobile and durable unit. They now jam less than the Orbital Jammer structures. We want to give players more means of countering the Emergency and Serpentine Turrets by disallowing them to target air. Can no longer target air units and drones. Call Serpentine Turret cooldown increased from 1 to 5 seconds. The Carving Turret was slightly over performing, and will no longer be targeting air units. Damage reduced from 500 to 450. The build time of the Refinery was extremely high, which was unintuitive given the relative cheap cost and size of the structure. Given the health buff the Harvester is receiving, the Refinery is getting its build speed lowered to make them easier to produce. On top of health reduction alongside the anti-air damage reduction, the Repair Bay Drones are getting a further health reduction to make disrupting their healing more viable. Previously they were more than triple as durable as other drones, now they are about double. Due to how Boost needed to be applied three times, it was ramping up in cost far too rapidly, especially compared to PHC Optimize. We are lowering the Quanta ramp up per cast so it ramps up more consistently with other Orbitals. 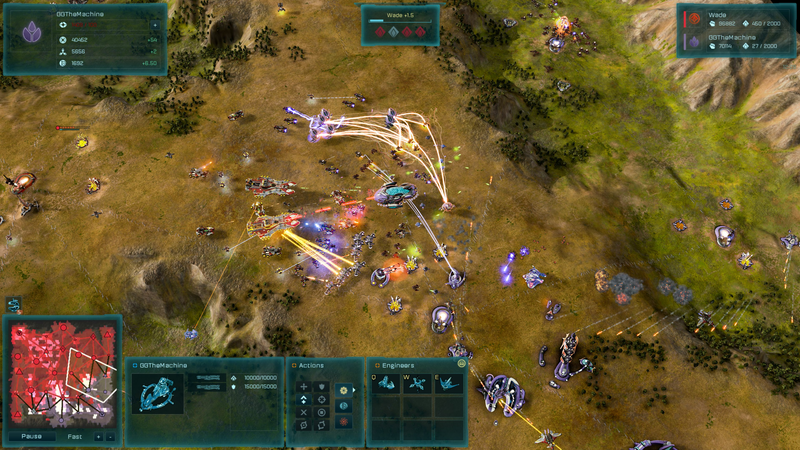 The long lifetime of the Drone Swarm was over performing due to the Drones ability to chase down units. 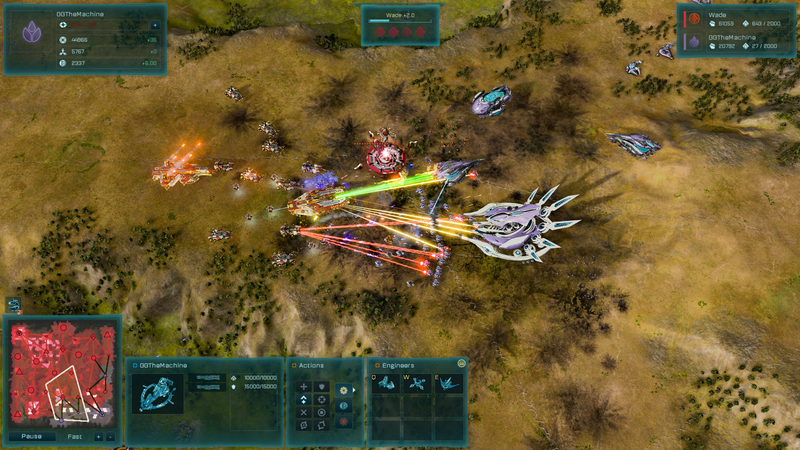 The inability to escape this ability, compared to Plasma Storm, often lead to wiping entire armies at a crucial time and consequently ending the game. Lifetime reduced from 60 to 30 seconds. The level requirements for Dreadnoughts was very low for the first couple of levels, then was extremely high for the high levels. This made it so Dreadnoughts were generally reaching level 3 in the first engagement, granting access to double instant repair which could be quite frustrating. Then it was practically impossible to get a level 5 dreadnought, which was unnecessary given that the higher upgrades are not any stronger than low upgrades, and in many cases are weaker. We are adjusting the level requirements to make leveling up Dreadnoughts more consistent and make the higher level upgrades more accessible. Many of the higher level upgrades are being buffed as they are currently very weak. The build time of Dreadnoughts and Juggernauts was extremely disproportionate for their cost compared to other classes of units. This resulted in a massive drain which was only sustainable after considerable economic investment, where players would have to cut all other spending in order to produce them. When players were able to afford Dreadnoughts, they were able to churn them out far too quickly. This made producing Frigates and Cruisers in the late game even less viable than they should otherwise be, and were rarely mixed in with higher tier units due to needing to have their production paused. We are significantly increasing the build time of Dreadnoughts, they will still be more time efficient to produce than Cruisers, but to a much lesser extent. Players will now able to sustain production of lower tier units while a Dreadnought is being produced, which supports the intended design of Dreadnoughts to “lead” armies with their bonuses. If a player wishes to focus entirely on Dreadnoughts late game, they are now encouraged to use Engineers to assist their Dreadnought production to cut down build time or produce two at a time. Build time of Substrate Dreadnoughts slightly increased to be consistent with PHC build times. The Prometheus and Savager now take 10% longer to build than other Dreadnoughts to reflect their higher costs. The Hyperion was too difficulty to destroy when upgraded with the Self Healing Hull upgrade, especially when combined with the healing drones. The movement speed from the Overload Engines upgrade was also far too little for it to be viable compared to the other powerful upgrades. Self Healing Hull regeneration speed halved. The Radar on the Cronus was far too little. For comparison, a Sensor Tower provides 2500 radar range. While the Prometheus is incredibly strong, the Precision upgrade was far too weak. Substrate Dreadnoughts are getting their energy cost for special abilities removed. This was inconsistent, unintuitive and unnecessary given the abilities are balanced around their long cooldowns. Instead, the Retributor and Savager will drain energy every time they fire their main weapon. They will retain a large storage of energy, so mixing in Capacitors will only be necessary for extended engagements. This makes energy consumption and Capacitors more of a consistent theme between different classes of units. The Power Plant upgrade was obsolete due to the Overmind not having a rapid consumption of energy. We are changing this to increase Shield regeneration, like the Savager Shield Regeneration upgrade to make it a viable upgrade choice. The Overmind and Nest of the Queen Drones are not getting their health reduced, effectively making them twice as durable. While the Savager and Prometheus were equally balanced at level 1, the Prometheus quickly outscaled and could destroy the Savager with ease due to getting access to both Overload and Draining Beam at level 2. The Savager, on the other hand, only got access to a speed boost and an armor increase which both had no impact on the Savager vs Prometheus interaction due to the full armor-piercing capabilities. We are exchanging the requirements for the Shield Regeneration bonus with the armor increase to give the Savager earlier access to an upgrade which will help it trade better against the Prometheus. In future we may rework and standardize the progression of Dreadnought upgrades to be consistent among different Dreadnought classes and factions, but for now, this will help balance the two Dreadnought destroyers. The Leonidas was underperforming given its enormous cost requirements. We want to incentivise players to invest in the Leonidas at the very late game, instead of just massing Dreadnoughts. Fixed a bug preventing players from building Barrager turrets on Noctus and Drengi. The early Nemesis Cruisers was quite frustrating as they would snipe Engineers and new players would not know how or why their Engineers died. The Zeus will be weaker against Engineers and more visually identifiable when they snipe a player's Engineers. We are also adding additional boss waves that spawn after the initial wave boss wave, so that if a player is late to capture their Turinium Generator at the start of the mission, they will have a challenge at the end of the mission instead of the waves stopping and the player sitting around waiting for the Turinium win with nothing to do defend against. When this mission was originally designed before Escalation, the Falcon was the basic anti-air defense in place of the Constable. Being suggested to build three Falcons is now completely overkill, so we are changing it to three Constables. Nemesis cruisers in wave 3 replaced with Zeus. Optional objective to build 3 Falcons replaced with 3 Constables. Additional boss waves are sent every two minutes after the initial boss wave. Roceda was too challenging on lower difficulties as beginner players could often not act fast enough to prevent a Turinium defeat. We are increasing the Turinium limit to give more time for the player to stop the timer, but increasing the resources on the enemy’s Nexus regions to allow the AI produce more units. Turinium requirements on Roceda increased from 1000 to 1500. Added an additional Radioactives and Metal deposit nearby the enemy AI. We want to give Noctus some strategic diversity by making a Turinium victory viable. There is only a single obscure Turinium Generator, and it took take far too long to accumulate victory off that. Turinium requirements lowered from 1500 to 500. We wanted to avoid new players from being confused when Mac tells you to use Amplify, which was renamed to Optimize. Objective and dialogue text has been updated for renaming Amplify to Optimize. Can now build Mobile Nullifier on all missions past mission 3. Some missions were set to hide terrain, which we have changed to terrain revealed to be consistent amongst all missions in Escalation. The patrolling Furies were incredibly frustrating and made the mission too challenging on higher difficulties as they would snipe the players Harvesters and had lots of upgrades making them much stronger than the players Dominators. Removed patrolling fury spawns on higher difficulties. Since Smarties no longer target air units and the Air Harbinger has been heavily buffed since Escalation launched, the Smarties needed to be replaced with Constables to restore the intended difficulty. Now has a proper map preview. Most of the Smarty systems have been replaced with Constables. Logoan and a few of the following missions are easy to cheese by Rushing the AI opponents with Air Rampagers which have been heavily buffed since Escalation launched and the campaigns were designed. We are adding a Constable to each AI player to make Air rushing a little more difficult. Each AI player now starts with a Constable to make air rushing more difficult. Removed a dialogue line that didn’t have any voice over. 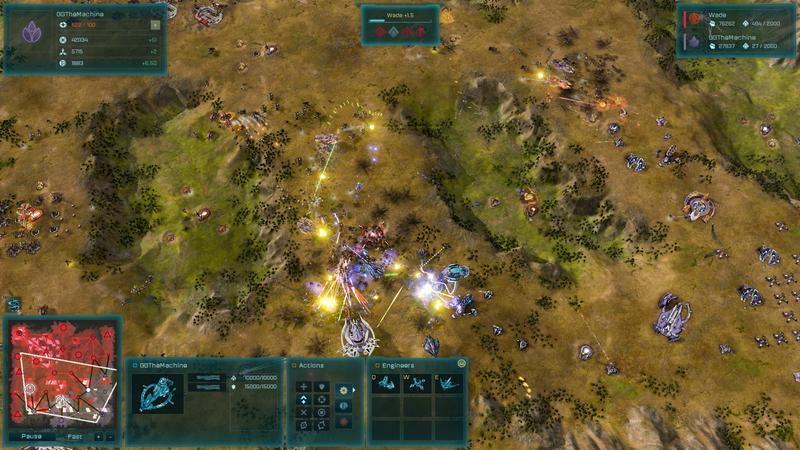 Starting with a free Aviary meant that players were able to rush out a Rampager as soon as the game started and shut down some of the AI opponents before they even had a chance to get their base established. The Aviary is a high tier structure for building advanced air units, giving the player a free Aviary at the start makes these missions too easy to cheese. Player no longer starts with a free Aviary. Mac now gets a wave of free Cruisers every 8 minutes on Expert difficulty. Mac now has an Air Eliminator next to his Nexus instead of a Falcon. We have been gathering player feedback about the difficulty levels of the Genesis campaign missions and are making them more consistent across by adjusting some of too easy or too difficult missions. AI difficulty lowered on Atwater and Bauhaus when playing on Beginner, Easy and Normal difficulty settings. Reinforcements from holding the central in Griffinclaw no longer pull the player's camera. 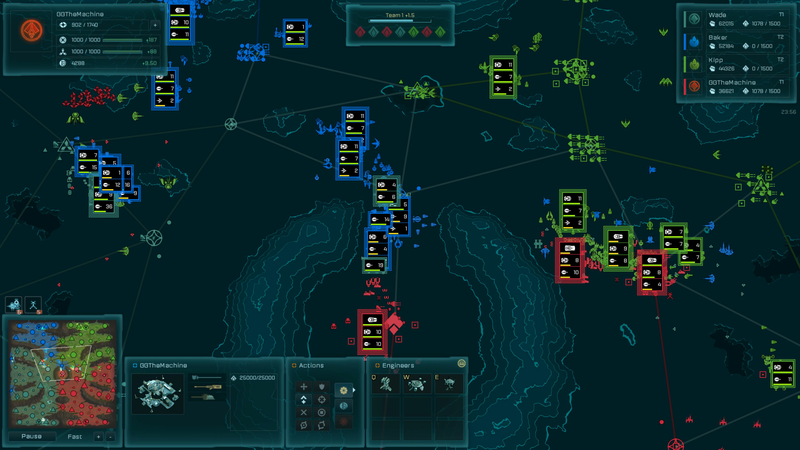 Fixed a bug on Glarus where Artemis Cruisers would not spawn if the Reinforcements player captured the regions. Some players were not aware that King of the Hill is an endless mission, so we are making it extra clear. Scenario description and in-game dialogue updated to explain that this mission is endless and players can not win. Assault and Overlord are some of our oldest scenarios, and as a result they had dialogue text displaying in a way which is no longer necessary, as well as having terrain hidden. We are standardising them to be consistent with the style of other scenarios. Assault was also far too easy for elite players due to starting with the Hyperion. Tidied up map to improve creep behaviour, appearance and pathing through tight choke points. Eruption was far too easy for elite players due to starting with the Hyperion. Players were also unable to make use of upgraded defenses. Player now starts with an armory in order to unlock upgraded defenses. Enemy AI now gets a free weapon and health upgrade every 15 minutes. This mission was too easy on higher difficulties. There was also a couple of buildings that were placed on top of each other. It was possible to cheese this mission by using the air scouts to fly over to the Turinium Generator. 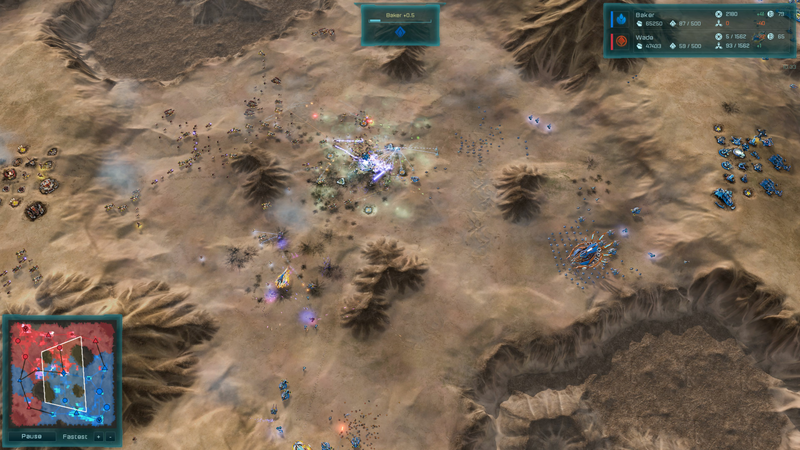 When this mission was designed before Escalation, there was no Air units available from the Nexus. Can no longer build Pan or Instigator. AI difficulty increased from Tough to Painful when playing on Expert difficulty. Turtle wars was too easy for elite players. Can't wait to give it a go! Thanks for all the hard work guys!